Last Monday we had the great opportunity to swim among immense bluefin tunas (some of two meters and a half long), which were under our feet and sometimes in front of us less than a meter away. Although it seems impossible, the Balfegó group has made this unique and unforgettable experience possible. This company, which since 2002 is dedicated to the capture, feeding, study and selling bluefin tunas is a pioneer in the world in this aquatic and culinary adventure. 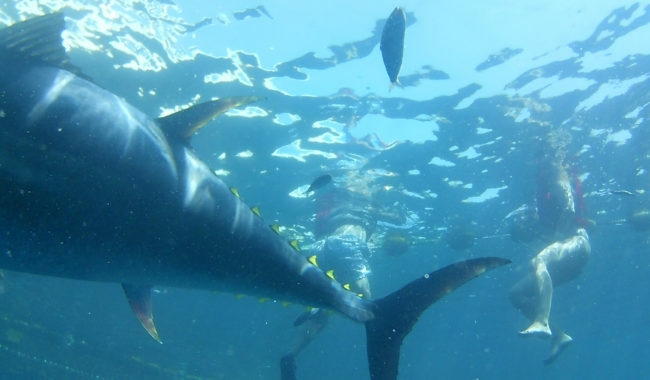 In 2012 they created the TUNA TOUR, with a catamaran designed for the case, that takes you to aquaculture facilities or swimming pools located 2.5 miles from LÁmetlla de Mar (Tarragona). 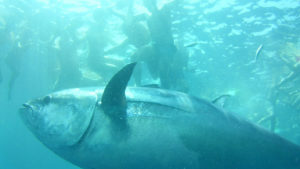 In these pools, there are approximately 400 bluefin tunas of an average of 2.5m in length and 250 in weight. They feed them with blue fish and remain until their meat reaches the optimum level of fat, color and texture, to make it an exquisite and high quality wild bluefin tuna. And they are precisely in these pools, where the catamaran moor, after a beautiful cruise with views of the coast, and where customers will enjoy the bath with and between bluefin! 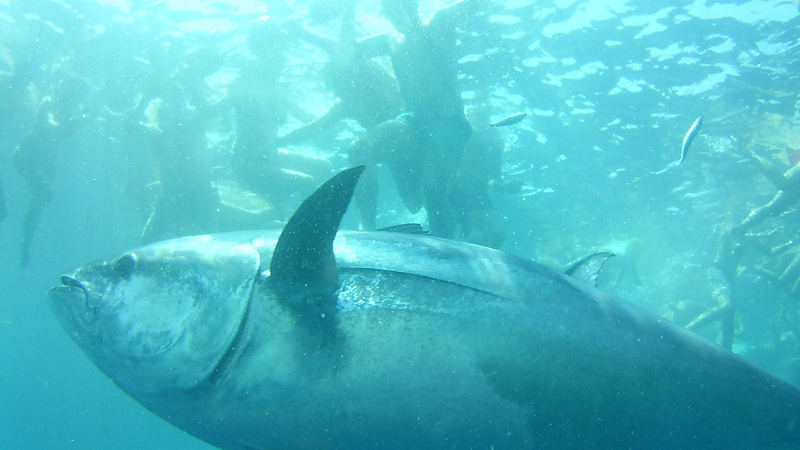 When you arrive, the show begins when they throw sardines to the pools, and you can watch from the boat, as the giant tuna dive to catch their food. The truth is that is quite impressive, they have quite sharp spines and yellow ones, and then you think: and am I going to get in there? But this company has been with this activity for more than 6 years, and there has never been any mishap. In addition, they inform you of some easy-to-follow security measures and there is a submerged diver at all times, rather, to make some very impressive photos and videos under water and then project them back. 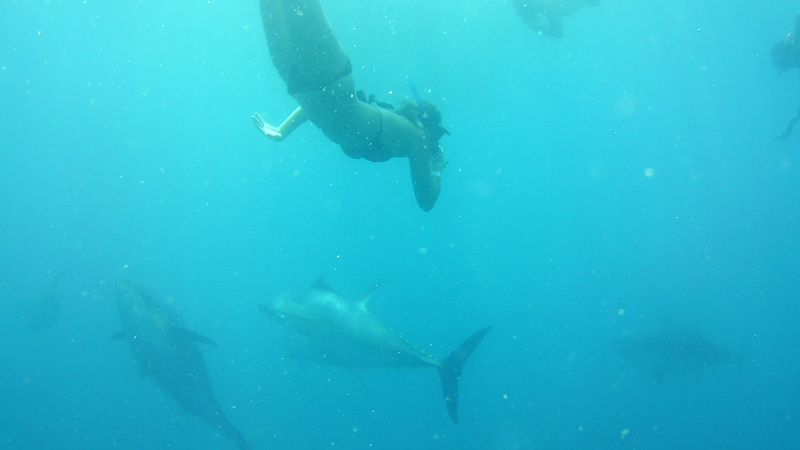 And the time comes with glasses and snorkel tube, you dive into the pool, and then y the way, it is the largest species of tuna, can reach up to three meters and it is an intense blue with a silvery white belly). The best thing is when they launch sardines, and when sinking to a depth little more than the one of your feet, the tuna is sent to its capture at an incredible speed and without touching you! Someone really hast to live it to be able to know what it feels like, there on the high seas … unique, unforgettable, incredible! And finally, after all the adrenaline released, back to the port, on the boat, you can taste this Gourmet product, with an intense flavor that melts in your mouth.